This app is aimed specifically at those with macular degeneration, who still can use their sight to read. It greatly helps those who know the technique of eccentric viewing but this method of training vision and practising should be known before using the app. The fact that it has such a simple interface, customizable configuration and audio usage instructions available make it easy to use and if the user has a monitor or a TV they can take advantage of the advantages of this app and read comfortably through a large screen. 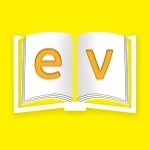 The MD evReader is a simple iPad app designed to help people with Macular Degeneration (MD) to read e-books when it is combined with the technique of “eccentric viewing”. Eccentric vision is when a person attempts to see by making use of their peripheral visual skills instead of the central ones (macular). The app enables the text (of e-pub documents) to be presented horizontally, from right to left, through the screen. The speed and the direction of the text movement may be controlled using a monitoring panel on the iPad screen. The text may be enlarged and presented in very large fonts on a digital screen through an HDMI port (this requires an Apple HDMI adaptor). The reader must fix their gaze in their preferred position of eccentric vision, far from the text, and read the text without moving their eyes. At present, the app cannot show books that are DRM-protected.